In 1914, Henry Ford introduced the assembly line, Charlie Chaplin gave the world a Little Tramp, Babe Ruth made his pitching debut and a group of designers in NYC led by Charles DeKay formed the American Institute of Graphic Arts (AIGA). A century later, with 67 chapters and more than 23,000 members, AIGA is the largest and longest enduring professional organization for design. 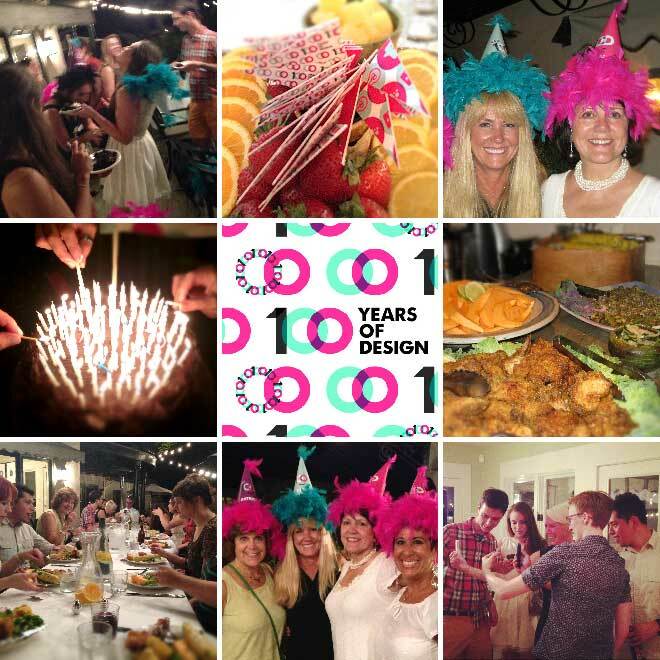 To celebrate this milestone, a series of AIGA-centric celebrations in the form of AIGA 100 Centennial Dinners will be hosted by local AIGA leaders throughout 2014. The purpose of these intimate dinner parties is to bring together a small group of established designers, young designers, students and educators to collaborate, share experiences and learn from each other. This will be an opportunity to understand our roots as designers, the tradition of impact that we share and provide the forum to pass those insights on to the next generation. It’s also a chance to party like its 2014. Ann Willoughby, founder of Willoughby Design and one of three AIGA100 National Chairpersons, held the first dinner on August 22 at her home in Kansas City. We captured the event as an example for other AIGA chapters to use when planning their own dinners during the centennial year. The AIGA 100 identity was integrated into napkin rings, wine labels and menu place cards. With the cake came the party hats. Albeit eccentric, something interesting happened when every person, old and young, established and new, donned those hats. The conversation turned from storytelling by the senior designers to a cross-generational dialogue where younger designers found their voices and the true spirit of AIGA came alive. Experience was traded for fresh perspectives and inspiration was shared by everyone. As more AIGA 100 dinners are held throughout the coming year, 2014 will be etched in our minds as a celebration, not only of design and designers, but also a tribute to the continuing impact of AIGA as we plan for the next 100 years.